Background: Spirocyclic compounds are important because of their unique structure and diverse biological activities. The indolo-spirocyclic scaffold is regularly found as a core structure of a representative family of bioactive natural products and among pharmaceutics, like alstonisine and spirotyprostatine. In the present work, indolo-spirocyclic compounds 3a-g and 4a,b have been successfully synthesized via electrophilic condensation reactions of indoles with a-cyclic ketones, including cyclopentanone, demidone, cyclohexane-1,3-dione, bicyclo[3.2.0]hept-2-en-6-one and isatin. Revised structure for compound 3c is described. All the synthesized compounds were subjected for the in- vitro cytotoxicity assays against A-549 (human lung carcinoma), MCF-7 (human breast carcinoma) and HCT-116 (human colon carcinoma) cell lines. Methods: Cell viability was investigated using MTT [3-(4,5-dimethylthiazol-2-yl)-2,5-diphenyltetrazolium bromide. This assay depends on the mitochondrial reduction of yellow MTT into purple formazan. All incubations were carried out at 37oC in 5% CO2 incubator in humidified atmosphere (Sheldon, TC2323, and Cornelius, OR, USA). Cells were seeded into 96-well microtiter plastic plates at the concentration (104 cells per well) and allowed to adhere for 24 hours. Medium was aspirated and fresh medium (without serum) was added to the cells with various concentrations of the test compounds (100, 50, 25, 12.5, 6.25, 3.12, 1.56 and 0.78 g/mL in DMSO) and incubated for 48 hours. Results: The tested components exhibited distinctive pattern of anticancer activity against all tested cancer cell lines. The more potent candidates were 3a, 3b, 3c, 3f, 3h, and 4b, which gave the high percent of growth inhibition (cytotoxicity), ranging from 85.7% to 98.6%. For the human breast adenocarcinoma MCF-7 cell line, compound 3c exhibited the highest activity, compared to other spirocyclic indoles and to the reference drug doxorubicin (IC50=31, 37.6, 38.2 with respect to the used cancer cell lines) with IC50= 3.4 µg/ml. 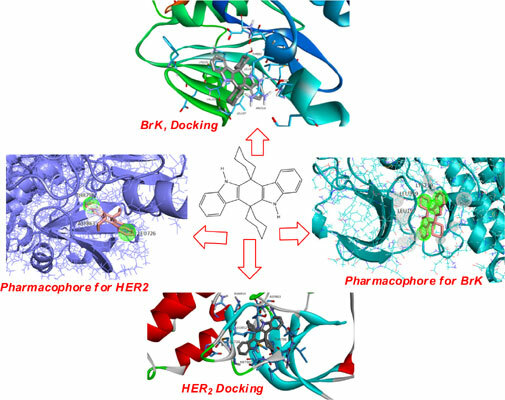 Compound 3c was docked into the crystal structure of the kinase domain of Human HER2 and BrK, which are most commonly associated with human breast adenocarcinoma MCF-7 cell line. SAR and QSAR studies have been described. Conclusion: Ten indolo-spirocyclics 3a-g and 4a,b candidates have been successfully synthesized. All the synthesized compounds were screened for their in-vitro anticancer activities in National Research Centre in Egypt, against A-549, MCF7 and HCT-116 cancer cell lines. As a result, they exhibited distinctive pattern of anticancer activity against all tested cancer cell lines. The most potent candidates were 3a, 3b, 3c, 3f, 3h, and 4b, which gave the highest growth of inhibition percent (cytotoxicity), ranging from 85.7% to 98.6%. For the human breast adenocarcinoma MCF-7, compound 3c exhibited the overall highest activity compared with the other spirocyclic indoles and with the reference drug doxorubicin with IC50: 3.4 g/ml. Compound 3c was docked into crystal structure of the most common associated protein kinase domains of human MCF-7 cell line, which are kinases HER2 and BrK. SAR and QSAR of compounds under investigation were described. Docking studies, cytostatic evaluation, 60 cell line screen, QSAR models, synthetic spirocyclicindoles.